Last week I was devastated to hear that one of my favorite restaurants in Denver, Pop’s Place, closed down. I immediately felt a pit in my stomach. I had been working on a post waxing poetic about how much I loved the restaurant and now I wished that I had hunkered down and written the post sooner, maybe I could have steered a little more business their way. I did write a pretty lengthy review of the place on Yelp (yes, sometimes I write Yelp reviews), publicly stating my love of the restaurant. I must have eaten there/taken out at least 15 times since discovering it. In some ways this restaurant turned this city where we live now into a “home” because we had a neighborhood joint that was our “place”. Now that “place” is gone and it makes me truly sad. I hope we find a new favorite soon. Below is a revised version of the post I was in the midst of writing — the first section written before the close, and the second section written after. I know it cannot help bring back the restaurant, but I still feel the world deserves to know how great of an eatery Pop’s Place was to visit. 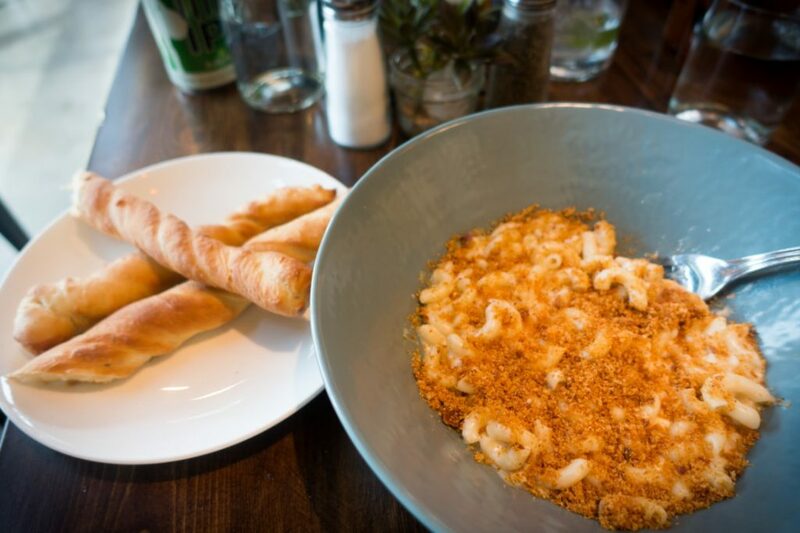 One night I was Yelping for some nearby mac ‘n’ cheese and up came Pop’s as a nearby spot. I saw in one of the reviews that someone mentioned that Jim Pittenger of famed Biker Jim’s Gourmet Dogs was involved with chef Stephen Kleinman, and it was this impressive pedigree that first got me in the door. The outside of Pop’s is completely unassuming, with nothing by the Art Deco-style font logo and a slogan of “Sophisticated comfort food” printed on a few outside windows. I had walked by this place a dozen times since it had opened and never gave it more than a sideways glance. That’s a shame because as soon as I stepped inside, I noticed the pleasantly sophisticated, yet friendly decor: Cheery yellow walls decorated with old black and white movie stills, contemporary wood tables and chairs with little vases filled with flowers, and a giant blackboard with a chalk drawing declaring “Welcome neighbors” positioned right above the open kitchen. I liked this place already. I am mourning the loss of the following fantastic dishes. Never again will I or others be able to taste the delicious excellence demonstrated at Pop’s Place. It’s really a loss to us all. I hope chef Kleinman opens another restaurant soon, maybe featuring some of the dishes that were on this wonderfully complex and varied “comfort food” menu. My first love, the Pop’s Macaroni & Cheese ($9.95). 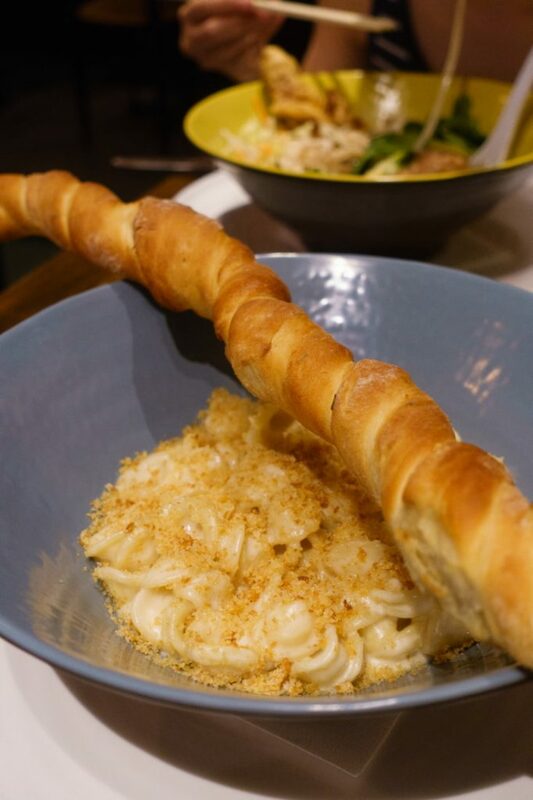 Described as a “four cheese cream & elbow macaroni” dish “baked with buttered breadcrumbs and served with focaccia sticks,” it is not hard to understand why this dish was my everything. The portion so large I could easily eat this for two meals, but normally I would shove all of it in my face despite being full because I just couldn’t stop eating it. Sometimes they served it with orecchiette instead of elbows. I don’t know why, but it tasted just as good. 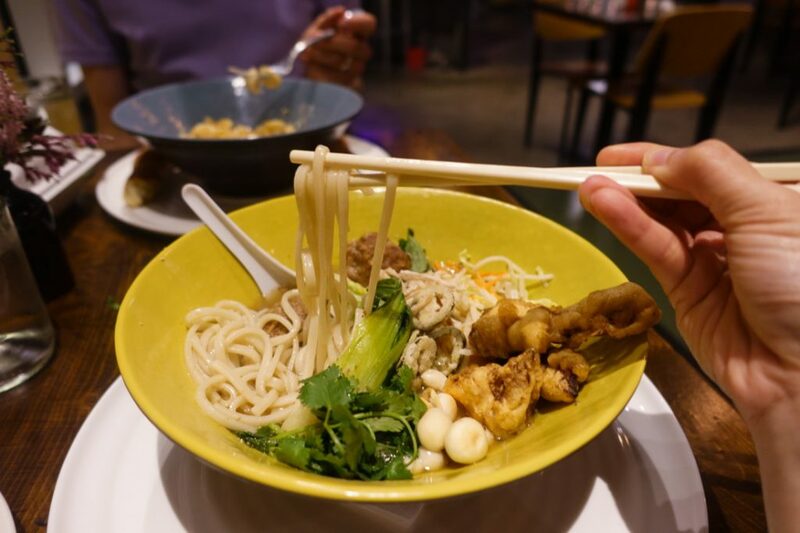 The Thai Noodle Bowl ($13.95) was another fave. Served in a chicken ginger broth with rice noodles, jalapeño, crispy shallots, “velvet chicken”, and Thai meatballs, this dish was the type of thing you’d want to curl up on the couch and slurp down. Loved the little mushrooms that were mixed into this dish as well. While we’re on the topic of soups, the Chicken Noodle Soup ($7.95 for the bowl size, not pictured) was also absolutely delicious and comforting and had these noodles that tasted a bit like soba, but were the thickness of fettuccine and was just homemade-tasting goodness. Stanton really loved the Tuscan Bean Soup ($7.05 for the bowl) with cannelloni beans, cabbage, potatoes, and leeks, finished off with a drizzle of olive oil. 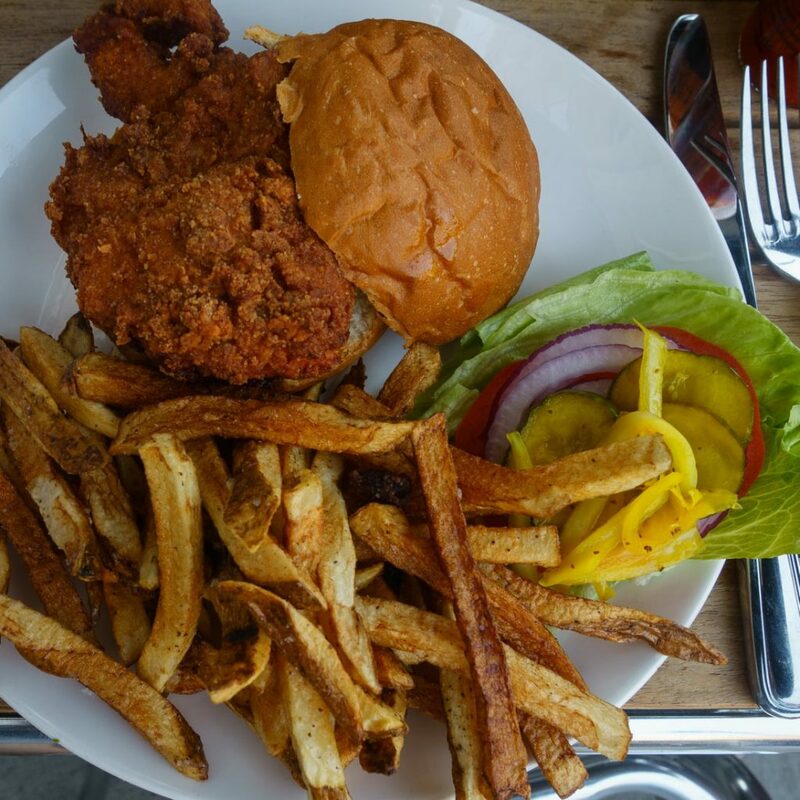 The Sous Vide Fried Chicken Sandwich ($8.95) was inspired. For less than 10 dollars you could get a perfectly crispy fried chicken breast with a moist interior. Just divine. Came with a side of fries. What a deal! The loss of the Blue Grits & Grilled Shrimp ($16.50) really brings tears to my eyes. Made with wild mushroom gravy, roasted scallions, and andouille sausage, I would often make an exception to my “no meat on the weekdays” rule. Rich and filling, and with those beautifully colored grits soaking up all of that savory goodness – this was the ultimate in decadent comfort food. And now I’ll never have it again. The world can be so cruel. 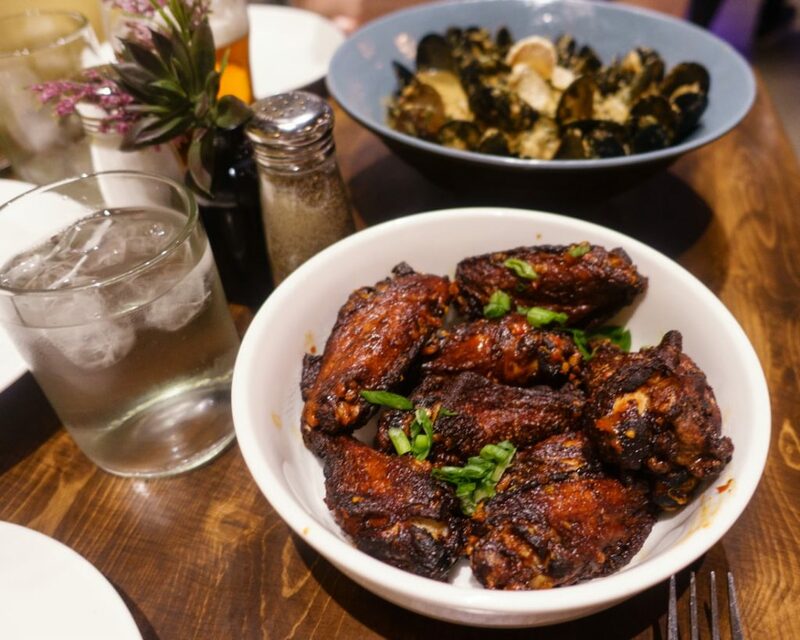 Starters so big they could have been entrees: The Black Mussels with red curry, jasmine rice, fried ginger, and crostini was good, but the Thai Chicken Wings with Merf’s Hand Grenade sriracha sauce was just killer. Very spicy, but super tasty. Pop’s Place was one of my first local loves, and now it’s gone. It’ll always have a special place in my heart, alongside other great “neighborhood” restaurants in my life that have served excellent food, but exited the food service scene. Pop’s us up there with the beloved neighborhood brunchery, ‘Ino in NYC’s West Village. It’s where my now husband and I used to brunch during the early days of our courtship, sharing your wonderful egg truffle toast and an unforgettable Tuscan bean soup that will forever haunt me in my dreams. You never think the good ones will go away, but sometimes they do. Thank you Pop’s for the great food and memories. You will not be forgotten. Has one of your favorite restaurant ever closed down on you? How did you cope with the withdrawl?